Abdel-Moneim Ibrahim’s status as one of the most exceptionally talented comedic actors from Egyptian cinema’s golden age is indisputable, even though he did not receive the limelight and fame enjoyed by other actors of his time like Ismail Yassin and Fouad Al-Mohandes. Until his very last day – 17 November 1987 – Ibrahim was keen to continue working, spending his days in rehearsals for a play titled Five Stars. He died at the age of 63. Abdel-Moneim Ibrahim El-Dughbishy was born on 24 December 1924 in Beni Sweif, Upper Egypt. After his father moved to Cairo, Ibrahim enrolled in a school in the Abdeen neighbourhood. He learned to play the piano and was good at speech and acting, and participated in all scholastic activities available at the time. Upon returning to his home village during summer vacations, he would gather his friends and form an acting group. He was encouraged by his father, who would regularly take him to see films as well as plays by Naguib Al-Rihani and Ali El-Kassar when Ibrahim was just 11 years old. Ibrahim went on to study at the Mechanical Industries School, where he joined an acting group headed by Adly Kasseb, who went on to become a well-known actor. Afterwards, Ibrahim became acquainted with actor Abdel-Moneim Madbouly and formed an amateur acting group, which Kasseb later joined, and they performed at Al-Azbakeyah Theatre in Cairo. This group of actors appeared in the film The Workshop (1940, Stephan Rosti). In 1945, Ibrahim enrolled at the Higher Institute of Cinema alongside Faten Hamama and Samiha Ayoub. When Zaki Tuleimat, the institute’s head, formed the Modern Theatre Company, Ibrahim became one of its members. Despite the noticeable success Ibrahim achieved in the play Goha’s Nail by Ali Ahmed Bakatheer, he was ignored by Anwar Wagdi when he decided to adapt the play to film, instead choosing Ismail Yassin to play the role, which drove the young actor into despair. However, this short-lived experience led director Ibrahim Ezzeddine to pick Ibrahim to play a small role in The Advent of Islam (1951), adapted from 'A Promise Fulfilled' by Taha Hussein. He remained away from the silver screen for two years before he was chosen to play a role in My Life Partner (1953, Elhamy Hassan) and in Buthaina’s Love (1953, Galal Mostafa). The size of his roles grew and their impact became more noticeable, until director Hassan El-Imam chose him in 1956 to act in Farewell at Dawn with Kamal El-Shennawi, Shadia and Yehia Shahin. This time, his success was so evident that Ibrahim's films jumped from only three in 1956 to 10 the following year, and 14 in 1959. What was most significant was that Farewell at Dawn set the template for what would become Ibrahim's most common role; the leading man’s best friend. In almost all of Ibrahim's 173 films, he portrayed the leading man’s best friend or the loyal companion. The character was considered an integral part of the commercial formula, the friend who is a source of comedy in a weepy melodrama, a soft romance, or even a musical. As such, demand increased for any who could perform this role. When Ibrahim’s name shone in 1957, there was no competing actor in the field besides Abdel-Salam El-Nabulsi, after Ismail Yassin stopped playing these roles in the early 1950s and moved on to leading parts. Ibrahim surpassed El-Nabulsi on several fronts. First was the age factor, as El-Nabulsi was almost 60 years old when Ibrahim was 33, and as such could play the young leading man’s best friend. The two actors also had different styles, with El-Nabulsi displaying an air of snobbery, nervousness and aristocracy, and was therefore limited in his ability to portray characters in a wide range of genres. Ibrahim, however, was able to convincingly portray a character from a low class milieu in I love You Hassan (1958, Hussein Fawzi), a collegiate in The Abandoned Pillow (1957, Salah Abu-Seif), a ruralite in Bahiyya (1960, Ramses Naguib), an aristocrat in Wife Number 13 (1962, Fateen Abdel-Wahab) a simple civil servant in The Female Fugitive (1958, Hassan Ramzy), and a broad-minded journalist in Cairo 30 (1966, Salah Abu-Seif). In the early 1960s, El-Nabulsi left Egypt and settled in Lebanon, while Fouad El-Mohandes moved on to leading roles in 1963. So, the arena was empty and Ibrahim became the only one who played this character type, which he embodied in around 25 films between 1962 and 1964. Although the range of his screen personas was limited, Ibrahim was keen to diversify his performances, and successfully liberated himself from the constraints of playing a single type of character. He even played cross-dressing roles in Sokkar Hanem (1960, Al-Sayed Bedeir) and City Lights (1972, Fateen Abdel-Wahab). He also played a very memorable mad man in Ismail Yassin in the Madhouse (1958, Essa Karama). 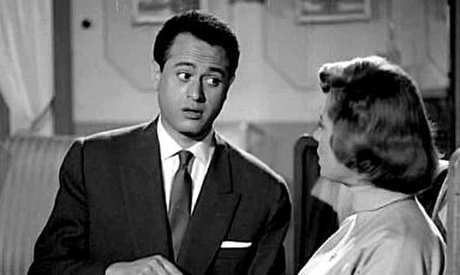 Ibrahim also made good use of his proficiency in speaking classical Arabic, as in his role of the Arabic language teacher who only speaks in classical Arabic in Ismail Yassin in the Navy (1957, Fateen Abdel Wahab), as well as in other films such as Ambassador Aziza (1961, Tolba Radwan) and The Mirror (1970, Ahmed Diaa-Eddine). One would also be remiss in not mentioning his impeccable performance as Yassin in Naguib Mahfouz’s The Cairo Trilogy. The role of the leading man’s best friend does not often leave room for deep character exploration, and Ibrahim was keen to make up for this by giving fully-charged emotional performances, making his characters resonate more with audiences than those of his contemporaries. Relying on this human dimension in performance, Ibrahim was able to perform successfully after passing the stage of youth. Those following his roles since the 70s and beyond – such as in Barefoot on a Golden Bridge (1976, Atef Salem), The Return of a Citizen (1986, Mohamed Khan) and A Way to go (1987, Bashir El-Deek) – will see why this brilliant actor left this indelible impact with his human roles. This was particularly true of his roles in TV series; Zeinab and the Throne (1979, Yehia El-Alamy) and Adam’s Sons (1986, Galal Ghoneim).